Summer's Here, So Cover Yourself with Bugs! This is Shoko Nakagawa. In Japan, she's a famous popstar and TV personality. She appears in Nintendo commercials and voices Pokémon characters. 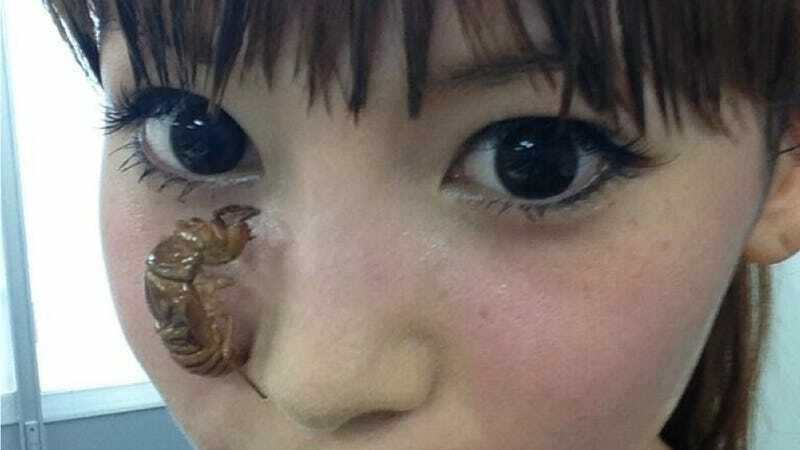 She also likes putting cicadas on her hair and face. Note: This article has content some readers might find objectionable—especially after they've eaten. Nothing quite says summer in Japan like the inescapable cicada chirping. Online, there's now another way you know it's summer: Shoko Nakagawa adorning herself in cicada husks. Nakagawa began the tradition a few years back, and it was in 2011 that her cicada hobby really got noticed online. However, she has done this stunt on her blog since 2006, always writing, "crunchy" (カリカリ or "karikari") a ridiculous number of times. Other people in Japan don't do this! Putting molted cicada on your head is definitely a Nakagawa thing. Most people find this pretty gross. Nakagawa's fans, however, seem both amused and revolted by these cicada antics. Recently, one of her cicada summer pics was retweeted over ten thousand times! Much of Nakagawa's appeal among fans is that she always seems to be having fun, whether that's talking about Final Fantasy VII, drawing Link, or putting bugs in her hair.